We have two great promotions going on our Relax Sauna as of this show, check out the audio for information on healing and detox and these specials. The Relax Far Infrared Sauna has won Five Awards and yields more far infrared healing light and extreme temperatures than all other saunas on the market at a fraction of the price of fancy wood saunas. 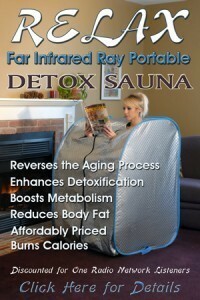 Phil has used The Relax Far Infrared Sauna virtually every day for many years and today is in excellent health. He is 68 revolutions around the sun, incredibly active in his passion for his work of educating people around the World about this unique technology. As you will hear, what ever he is doing is working. Check out this conversation with Phil and learn a great deal about healing and detox. We have several specials on this unique award winning sauna going on through the end of October. If you wear a hat in the sauna you avoid getting high blood pressure if you stick your head in, the eastern block people have known this for a long time. This sauna is generally used with the head outside the unit. However if you want to spend some time with the head and face in, very doable. In Ayurveda, 5,000 year old healing system, they suggest getting the head hot is other than the best for many reason. What about absorbing EMFs from being in the sauna? from the bottom of the floor to the bottom of chair. No more than you get driving in your car or any motor like juicer. Also, as Phil says here..you are well protected in the Far Infrared Light during your sit anyway. I use it everyday and blessed with excellent health…so, we are good with this issue.